Murderer of Ori Ansbacher was arrested two years ago on the Temple Mount and threatened: "If you let me go, I will come back with a knife." Terrorist Arafat Irfaiya, who was arrested on suspicion of murdering Ori Ansbacher near Jerusalem last Thursday, threatened to carry out a terrorist attack two years ago in order to become a Shaheed (martyr -ed.). Channel 13 News on Sunday evening published transcripts of Irfaiya’s interrogation in 2017, after he was arrested by police officers at the entrance to the Temple Mount with a large kitchen knife in his pocket. Irfaiya threatened then that he would carry out an attack again and that he intended to return to Israel with the goal of "becoming a Shaheed" or going to jail. During his interrogation in 2017, the suspect was asked whether he was a Hamas sympathizer, to which he replied in the affirmative, and detailed, "In what they do, for example, they defend the Palestinian people with weapons." According to the transcripts, Irfaiya changed versions during his interrogation. For example, he said at first that he did not think of stabbing or harming a policeman, then later claimed that he wanted to be arrested but did not intend to attempt another attack, and finally said he was willing to carry out an attack in order to be arrested. "I want to be a Shaheed," he declared at the time. When the interrogator asked him how he intended to become a Shaheed, the suspect replied, "I will do it again, I will buy a knife again and I will come back here to go to jail or be a Shaheed. I will do anything in order to go to jail. And if you release me, I'll come here with a knife and I'll be a Shaheed." Earlier on Sunday evening, the Israel Security Agency (Shin Bet) confirmed that the murder of Ori Ansbacher was a terrorist attack. In the course of his interrogation, the terrorist reenacted the murder to the Shin Bet and police interrogators and conspicuously connected himself to the case. The interrogation of the terrorist is ongoing and the details of the investigation are under a gag order. 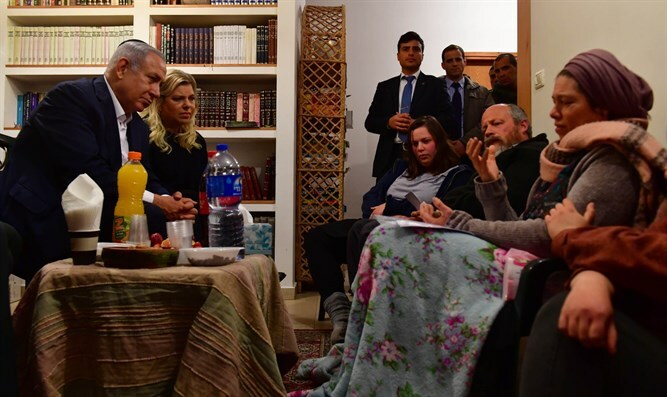 Prime Minister Binyamin Netanyahu on Sunday evening visited the family of Ori and briefed the family on the progress of the investigation.